USA outlasted Ireland 8-7 in a spirited match on Saturday, July 21st, 2018, the fourth international faceoff of the NBC10 Newport International Polo Series 27, presented by BMW. With Irish and US national flags rippling over the pitch, the national anthems of both countries followed the introduction of players. Wearing green for Ireland in the #1 position was Paul Ronan, with Siobhan Herbst at #2, Mark Stone at #3, and Colm Kelleher at #4. Representing USA in navy was Minnie Keating in the #1 position, with Michel Nseir at #2, Heather Souto at #3, and Dan Keating at #4. Ronan put team Ireland on the board first with a goal at the beginning of the first chukka. M. Keating responded for USA, ending the first chukka in a 1-1 tie. Herbst put Ireland in the lead once more, but not for long as Nseir and D. Keating scored two goals for USA, putting their team in a 3-2 lead at the end of the second chukka. Souto gave USA a two-goal lead at the beginning of the third chukka, and Ireland was unable to respond, ending the first half 4-2 in favor of team USA. Souto continued her scoring streak into the second half, and put USA up 5-2 at the beginning of the fourth chukka. Ronan was finally able to answer for Ireland, but D. Keating responded once more for USA, making the score 6-3 team USA. Ireland began to pick up the pace with a goal from Herbst to end the fourth chukka 6-4. Stone scored two consecutive goals at the beginning of the fifth chukka, tying the match for the first time since the second chukka. The father/daughter duo of D. Keating and M. Keating immediately put team USA back in a two-goal lead by the end of the fifth chukka 8-6. Although Ireland put up a strong rush for a comeback with a goal from Stone in the sixth chukka, team USA's defense prevented overtime, and USA took the victory in a hard-fought 8-7 match. During the match, a lucky lady from Manheim, Pennsylvania won a magnum of Veuve Clicquot Champagne in the weekly door prize drawing. An extravagant tailgate party in space 64 wowed the judges by decorating their tailgate with numerous national flags of Ireland, complete with an Irish picnic blanket and apparel. Specialty vendors and concessionaires were present in the Hospitality village at the polo grounds, and included the Twisted Pony Cocktail Bar, Horseshoe Wine Bar, Newport Polo Pro Shop, Flint & Flame, Brahmin, BMW and gourmet food trucks. After 6 chukkas, the match concluded with the Veuve Clicquot Champagne Toast & Trophy Presentation, as well as an autograph signing to meet the players. Each member of the Ireland team received a commemorative gift, courtesy of Flint & Flame, purveyors of professional grade, precision culinary tools. Presenting the 1992 perpetual USA vs. Ireland winner's trophy - a Paul Revere replica liberty bowl, symbolic of the New England region - were Cheryl & Bill St. George, hosts of Team Ireland. The evening concluded with an Après Polo Asado Lamb Roast to celebrate polo culture and Ireland's competitive spirit. While in Newport, the Ireland Team enjoyed many of the best attractions and highlights in the City by the Sea, including riding in style in a BMW X5 SUV; Newport Mansion tours; Secret Garden Tours of Newport for exclusive access to the private gardens of Newport's Point District; a glorious sunset sail; Sightseeing courtesy of Scooter World; Tennis on the legendary grass courts of the International Tennis Hall of Fame; Paddle boarding with Island Surf and Sport; cocktails & dancing at the Season Kickoff Bash on the eve of the match at the one and only Clarke Cooke House, and all the great goings on in the City by the Sea. 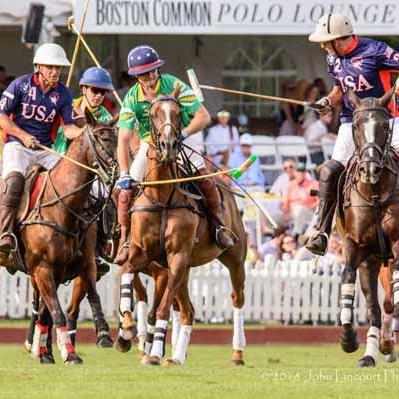 "Polo is an international sport, played in over 80 countries around the globe, and we are honored to have teams traveling great distances to play in Newport," stated Dan Keating, captain of the USA squad. "A following of Scottish fans from throughout the region has grown each time the Scotts are on the schedule, wearing kilts and waving 'the Saltire' St. Andrews cross in lively support of their fellow countrymen." Info about the Polo Series, our venue, concessions & amenities, and other information can be found on the About Newport Polo page. This is the 27th season of Newport International Polo Series, which has hosted teams from over 30 nations including, Ireland, Germany, Spain, England, Argentina, France, Egypt, India, Australia, Costa Rica, Ghana, Canada, Chile, Jamaica, Nigeria, Portugal, New Zealand, Barbados, Scotland, South Africa, Hungary, Dominican Republic, Netherlands, Kenya, Brazil, China, Italy, Mexico, Sweden, Singapore, Monaco, Morocco, Peru and Poland. The Newport International Polo Series is proud to present its 2018 sponsors including Gallo Thomas Insurance, NBC - 10, BMW Centers of Rhode Island, Modern Luxury Boston, Grace Hotels, Gurney's Newport Resort & Marina, Hotel Viking, Vanderbilt International Properties, The Chanler at Cliffwalk, Veuve Clicquot Champagne, Brahmin, Clarke Cooke House, Flint & Flame, Rockstar Limo, Stella Artois, Newport Daily News, Where Boston, Atria Senior Living, Goslings Rum, The Hermitage Club and promotional partners including International Tennis Hall of Fame, America's Cup Charters, Newport Helicopter Tours, The Cocktail Guru, Newport Mansions, Island Surf and Sport, McGrath Clambakes and Scooter World. “Our sponsors have been with us since the beginning. Without their support, the Series would not be as extensive as it is,” explains Dan Keating, Polo Series founder. There's no sport like polo. Be a part of it! Newport Polo hosts the Newport International Polo Series XXVII, and is the home of America's first polo club, est. in 1876, offering public exhibition matches, polo club member services for grass & arena polo, and polo instruction year-round; founding member of the United States Polo Association.